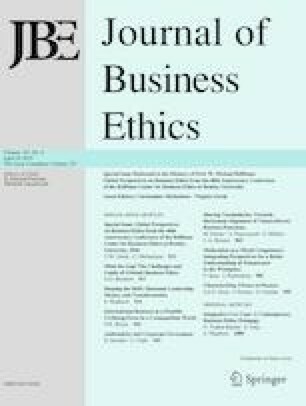 Though this paper acknowledges the progress made in business ethics over the past several decades, it focuses on the challenges and limits of global business ethics. It maintains that business ethicists have provided important contributions regarding the Evaluative, Embodiment, and Enforcement aspects of business ethics. Nevertheless, they have not sufficiently considered a fourth part of a theory of moral change, an Enactment theory, whereby the principles and values business ethicists have identified might actually be followed. Enactment theory argues that appeals to ethical leadership, moral imagination, and communicative participation have been insufficient to the task of closing the gap between what businesses do and what they ought to be doing. To address this problem, a theory of moral change focusing on the relations of power within which individuals and businesses operate needs to be developed. Drawing on the work of John Gaventa, the paper sketches some directions in which business ethics should proceed to help diminish this gap. The upshot is that business ethics needs greater connection with economic, social, and political theories. It also suggests that there are important limits to fostering the ethics of global business. Harris, C. E. (1999/2009). Towards a theory of moral change. Retrieved August 17, 2017 from http://www.onlineethics.org/Topics/profpractice/ppessays/moral_change.aspx#five.